Are you ready for some far-out adventure? 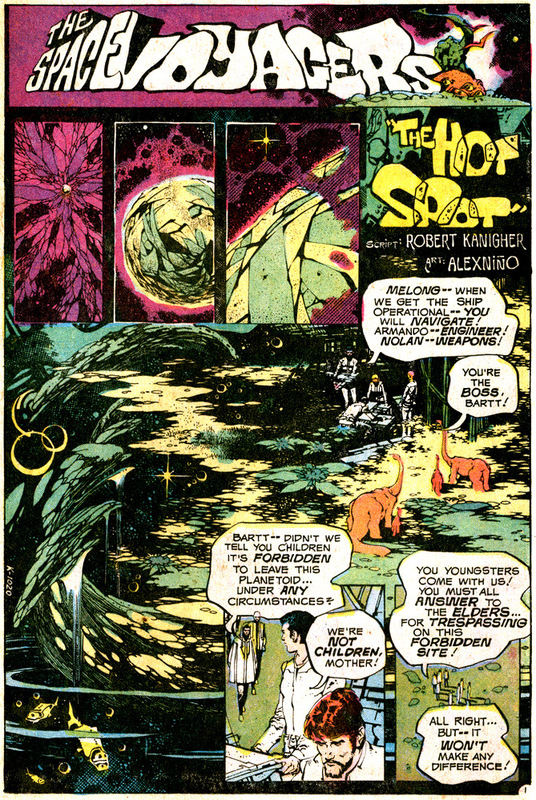 Witness the Space Voyagers encounter a giant, evil green cap in The Hot Spot! We don’t know what a green cap is, but you can get rid of it with Hyper Ammonia Saturation Bombardment. Hey, there’s even a dinosaur. 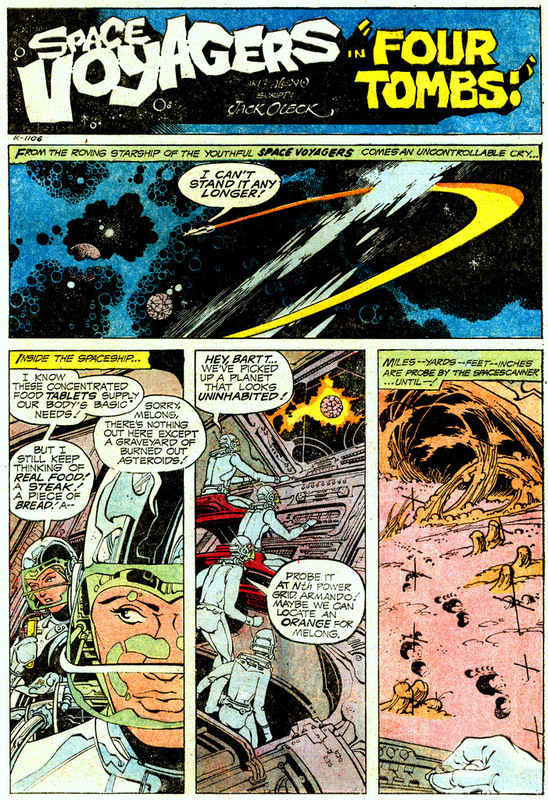 Featuring Alex Niño artwork, from a Robert Kanigher script. We have a complete collection of Space Voyagers, and an ongoing gallery of work from Alex Niño’s out-of-print Satan’s Tears. If you’d like to dig into our whole online Alex Niño gallery, just click Alex Niño. – From Rima The Jungle Girl #1-5; DC Comics. Alex Niño’s Space Voyagers: Four Tombs! Are you ready for some far-out adventure? Witness the Space Voyagers encounter a giant, evil alien from another planet in this classic short! Four Tombs is part one of a two-part adventure continued in The Delta Brain. Alex Niño artwork, from a Jack Oleck script. We have a complete collection of Space Voyagers, and an ongoing gallery of work from Alex Niño’s out-of-print Satan’s Tears. Four Tombs is part one of a two-part adventure continued in The Delta Brain. 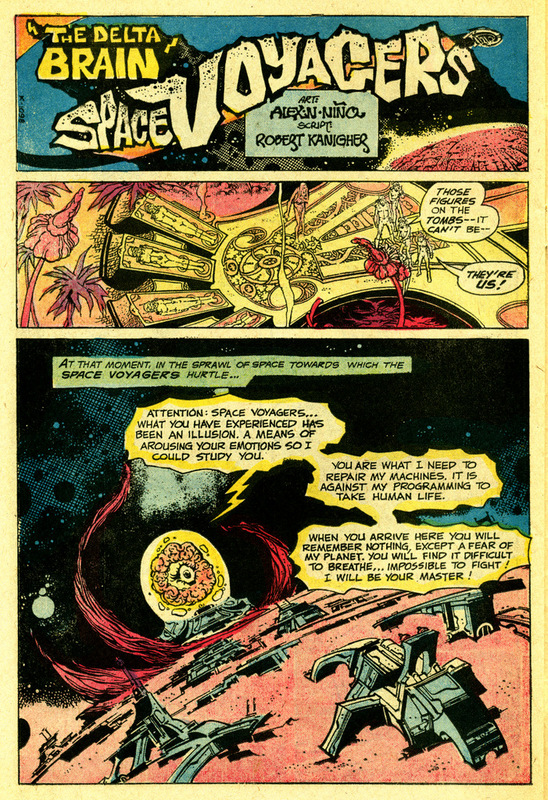 Alex Niño’s Space Voyagers: The Four Faces of Death! Are you ready for some far out adventure? Witness the Space Voyagers fight a giant, evil mob of clones in The Four Faces of Death! Alex Niño artwork, Robert Kanigher script. We have a complete collection of Space Voyagers, and an ongoing gallery of work from Alex Niño’s out-of-print Satan’s Tears. If you’d like to dig into our Alex Niño gallery, click Alex Niño. 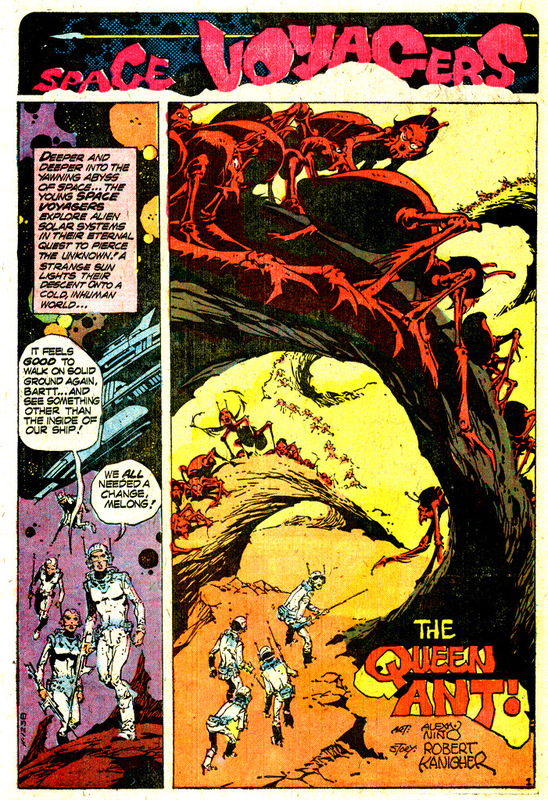 Alex Niño’s Space Voyagers: The Queen Ant! Are you ready for some far out adventure? Witness the Space Voyagers encounter evil giant ants from another planet in The Queen Ant! Alex Niño’s Space Voyagers: The Delta Brain! Are you ready for some far out adventure? Witness the Space Voyagers encounter a giant, evil brain from another planet in this classic short! The Delta Brain is part two of a two-part adventure that started in Four Tombs. 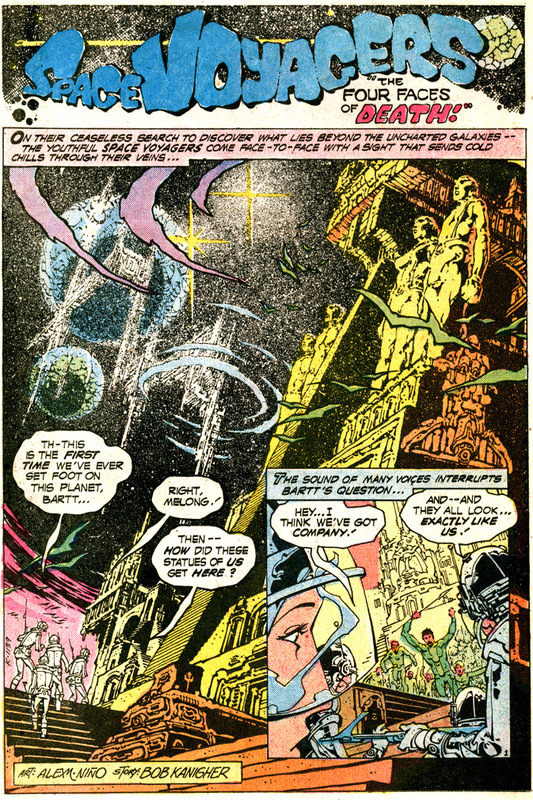 Alex Niño artwork, from a Robert Kanigher script. We have a complete collection of Space Voyagers, and an ongoing gallery of work from Alex Niño’s out-of-print Satan’s Tears. To dig into our Alex Niño gallery, just click Alex Niño.